Such a relief that the sun is out and the weather is warming up. Winter and Summer are both great, its the messy, wet, windy part in between that I disapprove of. But now that the sun is out and gloves have been dispensed with I had the pleasure of exploring Schiller street market. Admittedly I wasn’t the only one exploring the market as the suited bankers as traders were there in their droves, but it was fun nonetheless. The market goes the full length of the street and is partly a local farmers’ market selling meat, fish and dairy, but many of the stalls also grill, roast, or fry the food for you. The prices are very reasonable with the sandwiches going for about 1.50 to 3.50 and for about 5 you can get a small steak and chips. And for once it isn’t just grilled sausages on offer (although there are plenty of them as well). Once you have moved on past the grilled meats, towards the end of the street you will find some places selling tarts and pies, as well as at least one gourmet coffee wagon. I must have turned up at the wrong time as I couldn’t get close enough for any decent food pictures and didn’t have time to queue at each place. Maybe another time :-). I was surprised by one thing though. 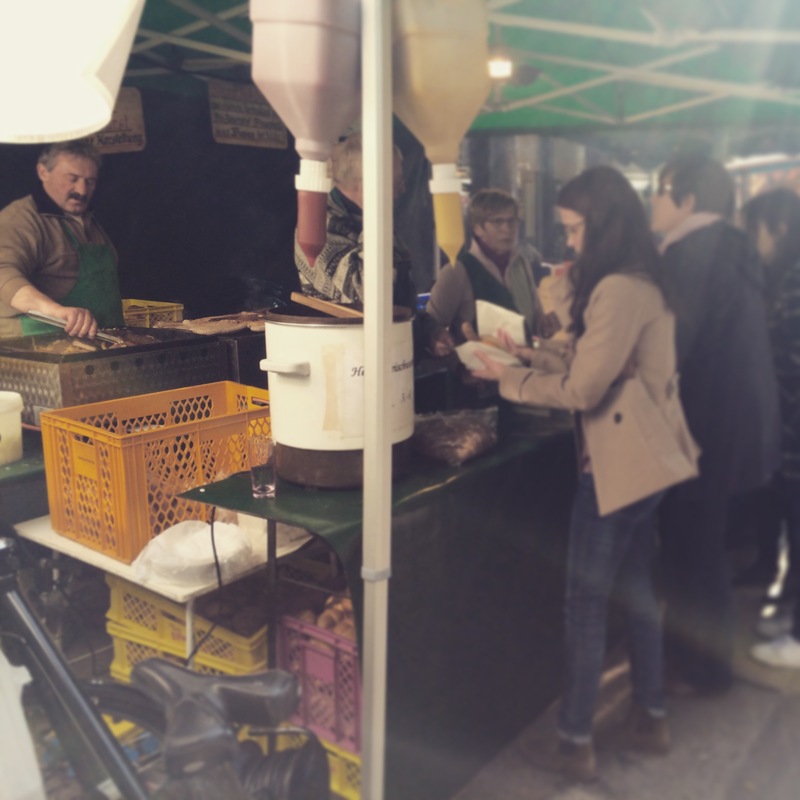 At the start of the market there was a fresh fish van where there were also selling a selection of smoked fish rolls. Must have been a dozen variations and made for a really nice change from always eating heavy meats. 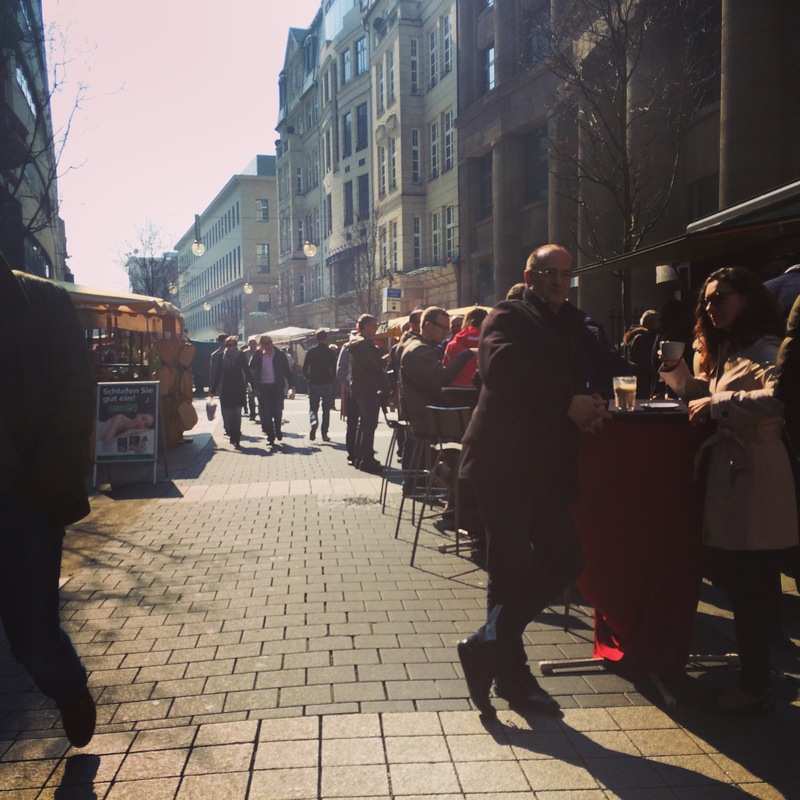 And if you don’t need to head back to the office afterwards, or simply decided to head over a little later in the afternoon, you will still find that you can get yourself a nice drink of wine in the sun. There is normally at least one stand offering a range of wines available by the glass. I’ll be back to try that as soon as possible!